Mediocrity is important! Being average in performance or having just an average product is a wonderful thing because without these entities, there would be no bar to raise, no excellence to strive for, or no respect to be gained. In the sport of diving, as in all facets of life, there is the standard...that which is accepted, that which is comfortable, and that which is considered the norm...the mediocrity of the industry! However, there does also exist the proud exception; an evident leader whose vision is backed by the relentless pursuit of quality and performance; a team of professionals who possess unprecedented prowess and experience in the field...a proud tradition of innovation and service. There can be only one true leader in the field of diving...that leader is Patco! For over 25 years now, Patco, Inc. has strived to embody excellence in all of its products and services while maintaining the absolute responsibility of customer satisfaction. The amazing field of diving is one, which has long been close to my heart. My family and I have had the privilege of being involved with the beautiful sport back since the younger years of my two beautiful children. My quest for great products began with my desire to enhance the comfort and safety of the diving experience for my two little girls. I have proudly taught them, and to all who I have shared diving with, that the sport is as adventure to an amazing world...a world that is ours to explore, but of course, with respect to all life. Resourceful fishing and cautious aquatic harvesting has always been a tremendous cornerstone of my diving belief system. With this is mind, I am always reminded that the beauty of diving, and its journeys into the miraculous wonders of the water, is in the fact that it knows no age. It holds no prejudice against age or ability. And, forever it will refuse to be held stagnant by any limits in vision or technology. This is where Patco comes in to play. 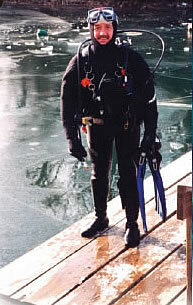 Patco products provide a cutting-edge to diving technology! Perfection is a standard when manufacturing our active heat systems, light systems and spearguns. From design and materials to performance and ease-of-use, the Patco tradition lives on in every one of our diving aids. And of course, there is the Patco guarantee of satisfaction which serves as the final component in making us a preeminent leader in service to the diving arena. Please take a moment to focus your attention to the many wonderful products we have made available to you, your family and your friends. Remember, we here at Patco can count on the world of diving to provide you with fun, adventure and excitement! You, the Patco customer, can count on US to bring you 100% satisfaction in our service every single time! Good luck in your adventures, always be safe and enjoy the journey!